The United Nations Legal Counsel, Mr. Serpa Soares, visits Baghdad, Iraq. 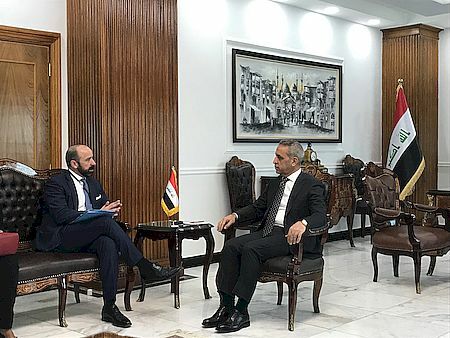 From 8 to 10 April 2018, the Legal Counsel of the United Nations, Mr. Serpa Soares, visited Baghdad at the invitation of the Government of the Republic of Iraq. The objective of the Legal Counsel’s mission to Iraq was to hold consultations in anticipation of the establishment and early deployment of an Investigative Team, pursuant to resolution S/Res/2379 (2017) adopted on 21 September 2017. In this resolution, the Security Council requested the Secretary-General to establish an Investigative Team, headed by a Special Adviser, to support domestic efforts to hold ISIL accountable, by collecting, preserving, and storing evidence in Iraq of acts that may amount to war crimes, crimes against humanity and genocide committed by ISIL in Iraq. The joint mission included officials from the Office of Legal Affairs, the Department of Political Affairs, the Department of Field Support and the Department of Safety and Security. It enjoyed the strong support of the United Nations Assistance Mission for Iraq (UNAMI), and in particular the Special Representative of the Secretary-General and Head of UNAMI, Mr. Ján Kubiš, and the Deputy Special Representative of the Secretary-General (Political), Ms. Alice Walpole, who accompanied the Legal Counsel in most of his meetings. 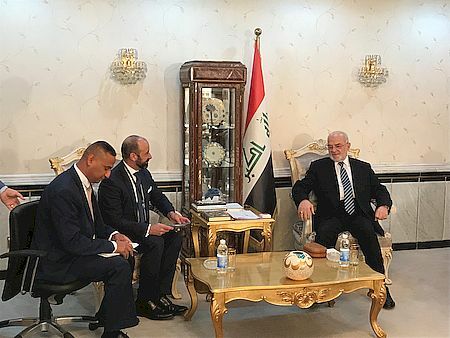 Meetings were held with representatives of the Government of Iraq, including Mr. Ibrahim al-Jafaari, Minister of Foreign Affairs, Mr. Erfan al-Hiyali, Minister of Defense, Mr. Qasim al-Araji, Minister of Interior, and Mr. Haidar al-Zamili, Minister of Justice, as well as with representatives of the Iraqi judiciary, including Mr. Fa’aq Zaidan, Head of the Higher Judicial Council, and Mr. Medhat al-Mahmoud, Head of the Federal Supreme Court. Additional meetings were conducted with the Steering Committee, which has been designated by the Government of Iraq as the main interlocutor of the future Investigative Team, the Independent High Commission for Human Rights, the Mass Graves Department of Martyrs Foundation & Medico-Legal Institute and with the International Commission on Missing Persons. In the margins of the official meetings, the Legal Counsel also met with representatives of the members of the Security Council, and with the Head of the European Union Delegation in Iraq. The Legal Counsel was pleased to receive a warm welcome in Iraq. The various meetings were conducted in a cordial atmosphere and in a constructive manner and displayed the disposition of the Government of Iraq to work closely with the Investigative Team. Upon completion of the mission, the Legal Counsel felt that he achieved his objective of undertaking, without delay, the necessary steps, measures, and arrangements for the speedy establishment and full functioning of the Investigative Team, in accordance with resolution S/Res/2379 (2017).